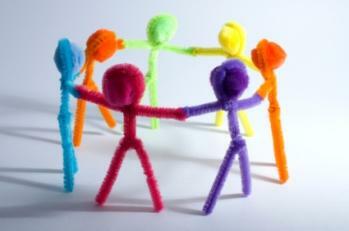 Making pipe cleaner people is a fun and simple craft for kids of all ages. Pipe cleaners are inexpensive craft supplies that can be used in a variety of projects. They are also safe for small hands to craft with, making them an ideal item for beginning crafters. Pipe cleaners can easily be cut with scissors or even fingernail clippers. Help small children with this part of the project, however. To combine pipe cleaners, all you have to do is place them against each other and twist together. You can also keep one pipe cleaner straight while wrapping another around the straight one. To create a coiled look, wrap a pipe cleaner around a pencil, then gently remove the pencil and stretch out the coil. To create a ball (which works perfectly for a head), again wrap a pipe cleaner around a pencil, but this time make sure the pipe cleaner sections overlap each other for a tight fit. Work at the end of the pencil, so that you can slowly enclose the top of the "head" as you wrap. To create legs, fold a pipe cleaner in half, and make a loop at each end for a foot. Coins can be glued to the feet of your pipe cleaner people to help them stand up. Boy-To create a simple boy figure, create a coiled body and a head, using the pencil method. Use different colored pipe cleaners for each section. Hook the head to the body by twisting the ends of the pipe cleaners on both sections together. Add arms and legs by attaching shorter pipe cleaner sections, and create hands and feet by shaping the ends of the pipe cleaners used for arms and legs into loops. Girl-Use the same technique as above to create a pipe cleaner girl. However, you'll want to add some hair to differentiate this figure from the boy figure. To add hair, cut several sections of pipe cleaner in a contrasting color from the hair. Coil these sections to create the look of curls, then attach each strand of hair to the head by twisting. For more emphasis, you can add a "skirt" by creating a larger coil that attaches to the bottom half of the body. To create the skirt look, wrap the pipe cleaner around a pair of scissors. Talking Child-This site offers instructions on a variety of pipe cleaner projects, including bendable magnetic people and animals, a butterfly wand, bookworm, charm bracelet, egg carton spider, and more. The Small Object-For a unique take on this craft, check out the "alphabet folk ornaments" at this site. These people would make a great craft for an elementary school project. Creating people and other objects from pipe cleaners is really easy to do, and kids love working with these versatile craft supplies. Have fun!